Avatar is a science fiction film in the context of imperialism and ecology where an aggressive corporation mining for a valuable natural resource is starting a military conflict with a native tribe which is living in harmony with nature, worshiping a mother goddess called Eywa. To advance it’s materialistic interests, the mining corporation uses an avatar, a hybrid, genetically engineered native-human body to interact with the tribe and the bio-botanical spiritual neural network it is connected to. In order to raise interest before the official cinema launch, the movie Avatar employs an avatar itself in the form of an online-video-trailer released into the wild of the YouTube-videocommunity. Our installation Avatar will introduce the avatar of the film Avatar’s online video-trailer represented by a massive lignite coal briquette body equivalent to the volume of coal that was burnt for the creation of the electrical energy used to serve, transmit and view the online-video-trailer one million times. We convert pixels into briquettes, a naturally engineered valuable fossil resource produced by mining the network Earth we are connected to. Where Ava is another form of Eve (Eywa) and tar is another form of coal, the Internet is our only chance to enhance human development, a precious intellectual resource, our native body of knowledge. Even if we would consider only one percent of the available information in the net to be valuable, it would justify the large amount of natural resources we are investing at this point of human development. With the availability of information comes a deal: the individual responsibility of knowing and acting. 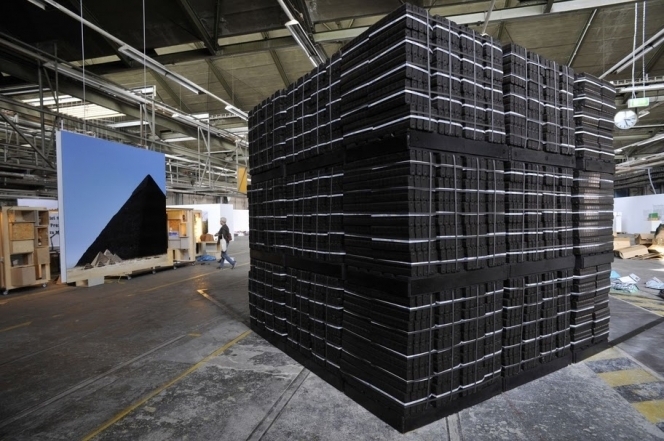 On October 29th, 2009, just after the release of the trailer and the manifestation of our concept, the trailer hit one million views, which creates the exhibited cube with a side length of three meters and a weight of 37 tons. As of June 1st, 2010, the total views for the trailer have surpassed 14.5 million creating a cube with the side length of seven meters, weighing 540 tons. The cube is continuously growing and hence so is the amount of coal physically burnt in exchange.